The Cognac vine-growing area is the largest white grape vineyard in France. The production area was geographically defined by official decree on 1st May 1909. Then, based on the nature of the soil, the six Crus in the Cognac vineyards were marked out and later confirmed by the official decree in 1938. From the 13th Century onwards, the English, Dutch and Scandinavians appreciated the wine that came from the region of France that is today called the Poitou-Charentes. This wine was produced in three particular areas; the Poitou, the northern half of the current Poitou-Charentes; from around La Rochelle; and from the Angoumois, which corresponds to the modern Charente departement or county. The drink, the product of good quality vineyards was transported to North European countries by boat. 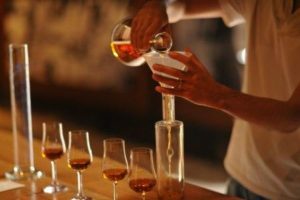 Then, at the start of the 17th Century, the Dutch invented the process of double distillation- the wine was distilled twice to create a brandy that was both very stable and highly concentrated, making it much cheaper to transport. During delays in loading the cargo, it was noticed that this brandy- eau-de-vie in French- seemed to get better as it aged in the barrels! And so Cognac was born, a brandy that took its name from the town that was to become the capital of a world-famous trade.